This site was last revised March 18, 2000. "I choose weird stories because they suit my inclination best--one of my strongest and most persistent wishes being to achieve, momentarily, the illusion of some strange suspension or violation of the galling limitations of time, space, and natural law which forever imprison us and frustrate our curiosity about the infinite cosmic spaces..."
Some notes about the site revision. I decided it was high time to move all the comments from the main page so that readers no longer had to scroll past them to reach the index section. I also thought it would be nice to have several neatly ordered pages instead of one big page with everything lumped into it, therefore, story and poem indices are moved to another page rather than the main one, likewise all incidental graphics (the background graphic will remain the same for all pages). Since the "favorites" list was getting rather large, I have dispensed with it and decided instead on a general links page listing links both essential and of peripheral interest to readers of this site. All index pages are linked to all other index pages, so there is no need to return to this main page when moving from one part of the site to another. I have also discarded the background music. Also, the stories and poems indexed on this site will no longer be linked to this site. 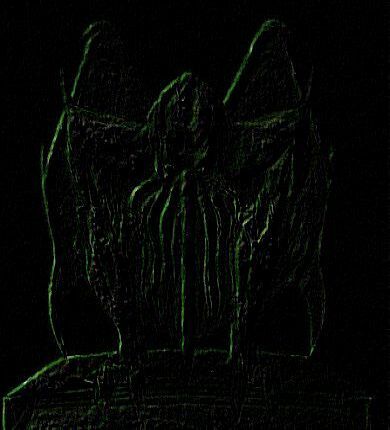 I felt that I shouldn't be stealing the glory of such web publishers as Nightscapes and Mythos Online, therefore my stories and poems that are published there or elsewhere on the WWW will simply be linked from here to the web site of its original publication. There will be some exceptions to this. Occasionally I may put something on this site that has never been submitted anywhere, or perhaps alternate versions may be found on this site that aren't found elsewhere. If you came here looking for any poems by Lovecraft himself, they are still here, under the "Poems" section. I hope I haven't forgotten anything in the redesigning of this site. If you see anything that you think is amiss, please let me know. the background graphic to this website, as well as a couple of icons.